With over four decades of liquid handling experience and hundreds of thousands of instruments in use worldwide, INTEGRA pipette controllers have become the reference for precise and efficient serological pipetting. Our customers praise the PIPETBOY acu 2 pipette controller for its unmatched speed, pipetting control and ergonomics. 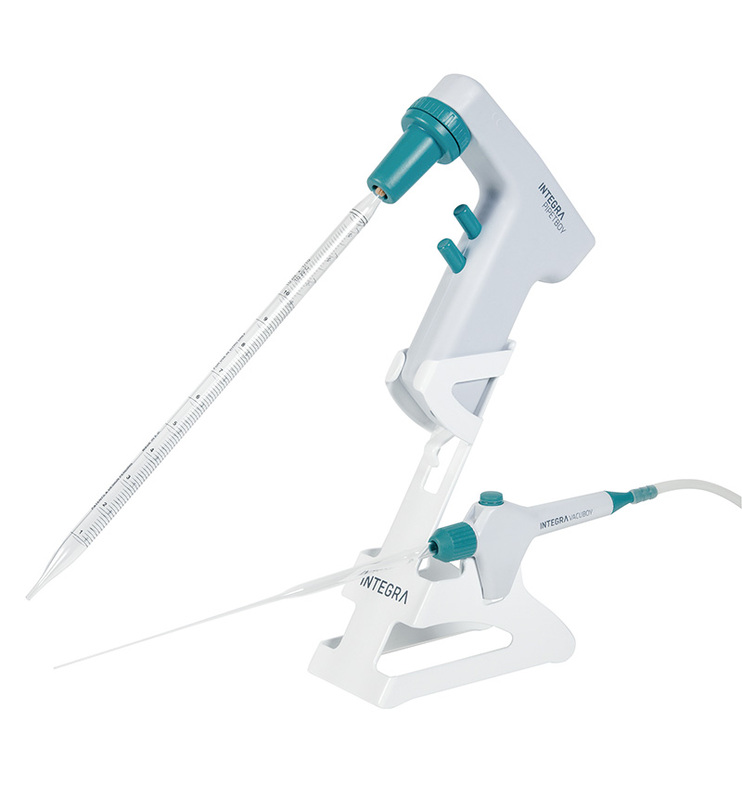 The second generation of PIPETBOY acu pipet aid is equipped with the latest technology providing an increased pipetting speed and a significant weight reduction of the instrument. PIPETBOY acu 2 has been designed following the ergonomic shape recommendations to sit comfortably in all hands and allow your fingers to keep a natural position all along your pipetting activities. With only 195 grams and an optimized weight balance, PIPETBOY acu 2 offers you enhanced ergonomics making even prolonged pipetting stress- and fatigue-free. PIPETBOY acu 2 is fitted with a unique motor design providing a wide range of pipetting speed and a unique valve and dosing system offering an unmatched control of the liquid, from drop by drop dispense to fast liquid displacement. When working with large volume pipettes, the new Turbo Mode provides the unit with 20 % extra pipetting speed. Simply connect the mains adapter to the instrument to make it the fastest pipette controller on the market. PIPETBOY acu 2 pipette controller is equipped with the latest Lithium-Ion technology, which provides an extended cordless working time of over 6.5 hours non-stop pipetting with a fast charging time of only 3.5 hours without memory effect. The LED battery indicator clearly informs you about the charging status of the instrument by simply switching between red and green. PIPETBOY pipette controllers are designed and manufactured to the highest quality standards and therefore offered with an extended 3 YEAR WARRANTY UPON REGISTRATION. Pipette controller complete with battery Li-Ion, mains adapter, spare sterile filter 0.45 µm and wall mount. 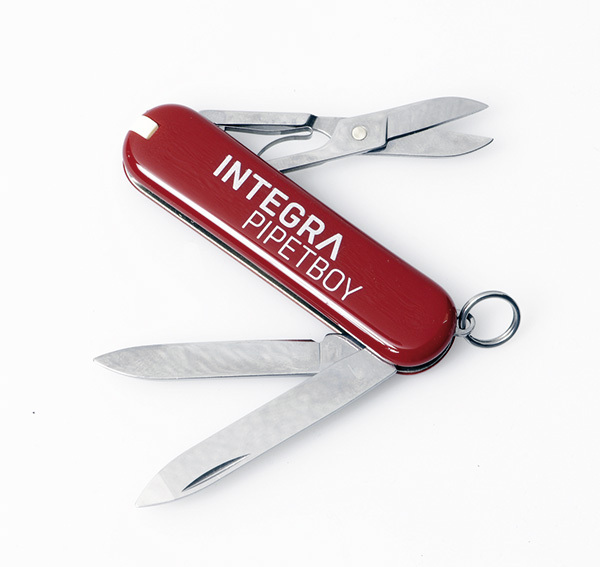 A free Swiss pocket tool is included with each PIPETBOY acu 2. WARNING: Batteries are not compatible! Win a PIPETBOY from our new summer color collection!